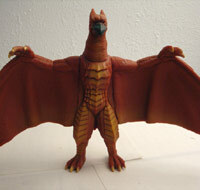 Released in conjuncture with Godzilla's 50th anniversary film, this figure of Rodan is based on the 2004 version of the character. 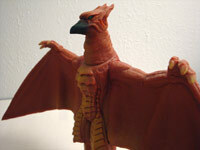 This is one of several figures that were distributed in the six inch line that year from Bandai. In terms of quality, this toy is simply okay. It doesn't do anything particularly praise worthy, but at the same time has few major faults. Starting from the top, the figure is a fair representation of the suit in the film in terms of proportions. The fingers are a little larger, which is a plus as they are sturdier this way, and the neck is a little shorter than it was in the movie. The neck aspect isn't really much to complain about, as it seemed overly tall in the film anyway in order to accommodate the actor's head. The eyes are slightly smaller than they should be as well, which in this case is a bit of a problem as it does considerably change the overall feeling of the figure compared with its movie counterpart. Now for the coloring this is a bit more mixed. The largest fault is the fact that the peak is black here, rather than its normal dark gray. It doesn't look bad on the figure, but is a large divergence from the source. The chest is also fairly simply colored, as it was blasted with some light orange. This is a bit disappointing given how simple the coloring is for this figure. It would have been nice to see the black component of the chest, which should have been under each plate, added in considering that so little coloring was required to begin with. In terms of detail, the toy is good from the mold perspective. 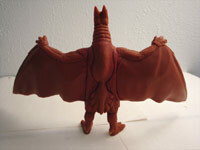 The chest is elaborate to show off the plates and spikes while the feet are highly detailed. The back is also constructed well and is true to the source, including the obvious location where the back was removed to grant the actor access. Overall, this is an okay figure that does a good job of representing the suit. As a side note, it was later re-released the following year. The 2005 Bandai has a more elaborate paint job, making it a bit more esthetically pleasing although it arguably went overboard in this regard. In the end, either is a good choice to pick up if one wants to add this version of the character to their collection.